First up on our list of 2019 RV Trends – Brighter colors both inside and out. We began to notice this trend last year with our Rockwood GeoPro line. Their light interior colors make these 7′ wide trailers feel extra-spacious! Exterior colors are changing too and you’ll notice that when our new Cirrus 670 truck camper shows up on the lot! It’s already evident in our NuCamp [email protected] and [email protected] campers: we’ve got red ones, blue/green ones, and all sorts of other color combinations available too! 2. Energy efficient lighting both inside and out is gracing our RVs these days. In fact, in our recent R-Pod video we mention exactly that feature on the new 2019 R-Pods: LED lighting inside and out! When you’re boondocking and need every ounce of battery power you can get, being able to save some energy by utilizing LED lights is a great plus! 3. Outlets, Chargers and Solar, OH MY! More and more ways to plug in, charge devices and gain power are on the way. Most RVs today have a solar panel or come solar ready so that you can easily plug-in your solar panel at camp and keep your batteries charged. In some 5th wheels the addition of pop-up power pedestals means outlets are out-of-sight when not in use, but easily accessible when you need them. More USB charging ports have been added too: usually located near your stereo or entertainment area, but also by the bed too. 4. 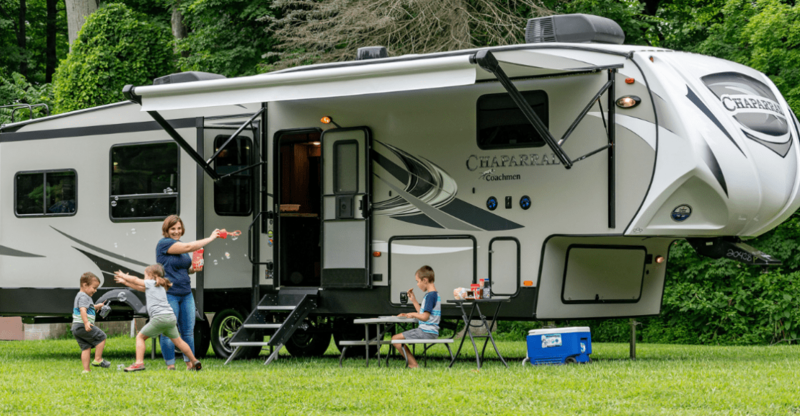 Comfort is truly reigning supreme in campers of all sizes these days; fifth wheels have added reclining chairs and larger TVs. Travel Trailers and Truck Campers have added levels of luxury with additional storage, Corian countertops, and larger sinks with pot-filler faucets. 5. Speaking of storage…RV manufacturers are creating all sorts of ways to add extra storage. From over-head cabinets in sleeping areas to full on pantries and coat closets in larger RVs, it seems there is no lack of storage options these days. Netting is finding its way into more nooks and crannies, to help keep items from moving during travel, and every bit of possible storage space is being utilized. Under bed storage, under dinette storage, overhead storage, drawers, closets, pantries, pass-through storage, hidden storage…you name it! 6. Finally, RVs are getting WiFi boosters these days as well. This means it’s easier to stream your favorite show on a rainy day or work from the RV when you need to. It seems that RV designers are more thoughtful in their RV designs. From the addition of exterior kitchens to new and brighter colors, 2019 RV trends seem to be all about making your camping trip even more comfortable!